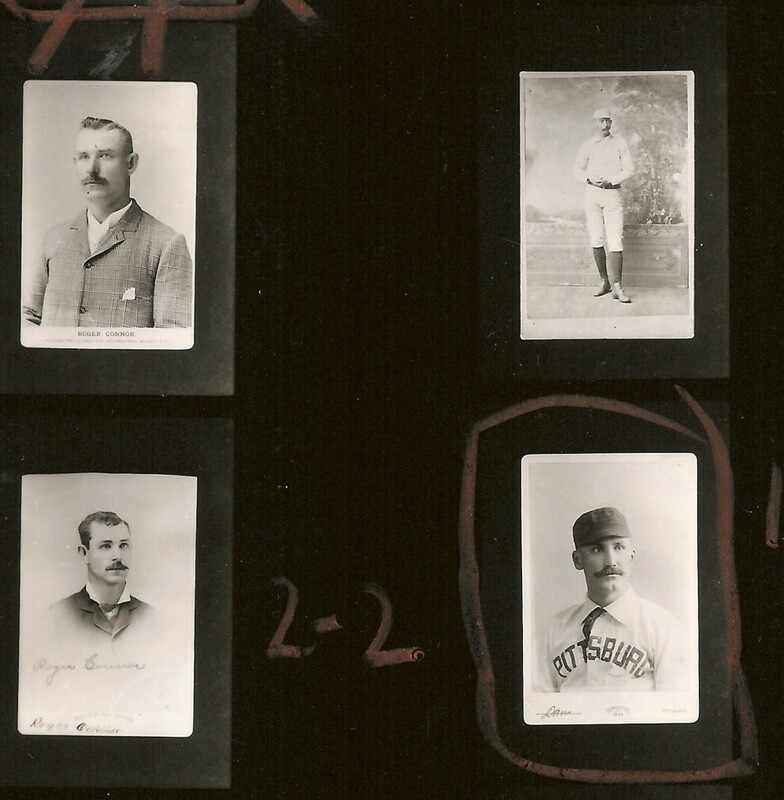 A recently discovered contact sheet from a 1983 photo shoot conducted by the Society for American Baseball Research (SABR) shows a rare c. 1890s cabinet card of Hall of Famer Jake “Eagle Eye” Beckley as part of the National Baseball Library’s photograph collection. The card was reproduced for the 1983 SABR publication, The National Pastime: A Review of Baseball History, edited by John Thorn and Mark Rucker, and is credited to the Hall of Fame’s National Baseball Library. A recent Haulsofshame.com examination of the contact sheet featuring the Beckley card has determined that this exact same cabinet photo was also offered for sale in a 1999 sports collectibles auction in Oregon. So how did this Hall of Fame treasure make its way out of the Cooperstown shrine and end up on the auction block 3,000 miles away? The answer may lie in another recent auction offering closer to Cooperstown, in New Jersey. In May, New Jersey auction house Robert Edward Auctions offered another rare card confirmed stolen from the Hall of Fame collection. That card was an 1890’s Joseph Hall cabinet card of Hall of Fame pitcher Smilin’ Mickey Welch, which had also been documented as part of the Hall’s collection in photographic negatives of the card produced in the 1960’s. The Welch card was pulled from the auction. Although the Welch card did not appear in the 1983 SABR publication, several other Joseph Hall cabinets from the Hall of Fame collection did. The stolen Jake Beckley card appears on the same contact sheet as other 1891 Joseph Hall cabinets including the image of New York Giant slugger Roger Connor. Back in May, Hall of Fame employees could not locate several other Joseph Hall cabinets which were documented as part of the Hall of Fame collection on the 1983 SABR contact sheets. 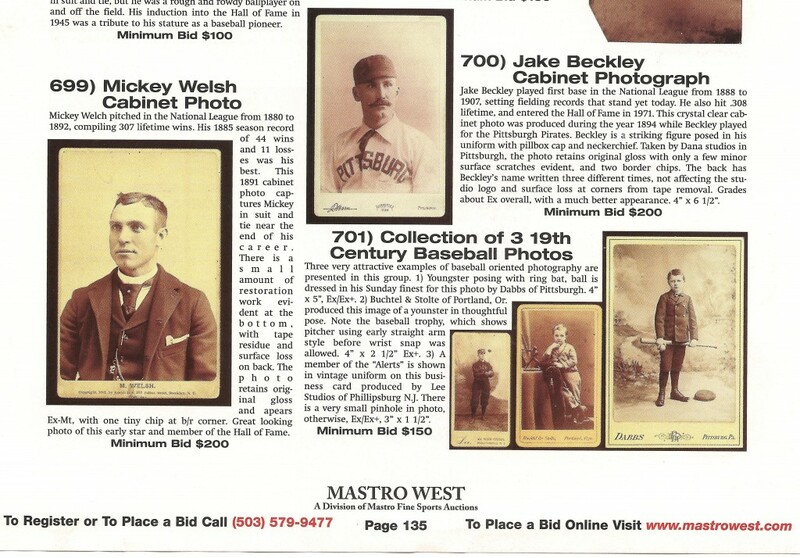 Further investigation into the thefts by Haulsofshame.com has revealed that both the Beckley and Welch cabinet cards were offered in the same 1999 baseball auction conducted by MastroWest, a former division of Mastro Fine Sports Auctions of Chicago. The Beckley card appeared as lot number 700 and the Welch card appeared as lot number 699 . When Haulsofshame.com requested to see the Beckley card in May, 2010, Hall of Fame library staffers were unable to locate it. It appears that, for over a decade, the pilfered Beckley card has been making the rounds on the baseball auction circuit. When contacted by Haulsofshame.com, Brad Horn, the Hall of Fame’s director of communications declined to comment or issue a statement. When contacted in May in regards to the Mickey Welch card, Horn, on behalf of the Hall of Fame, stated, “We will not comment further on any research requests regarding the contents of our collections or the history of specific collections.” It was also in May that Haulsofshame.com made specific research requests of the Hall of Fame related to the thefts from its collections. Today, over three months later, those research requests have still not been fulfilled. 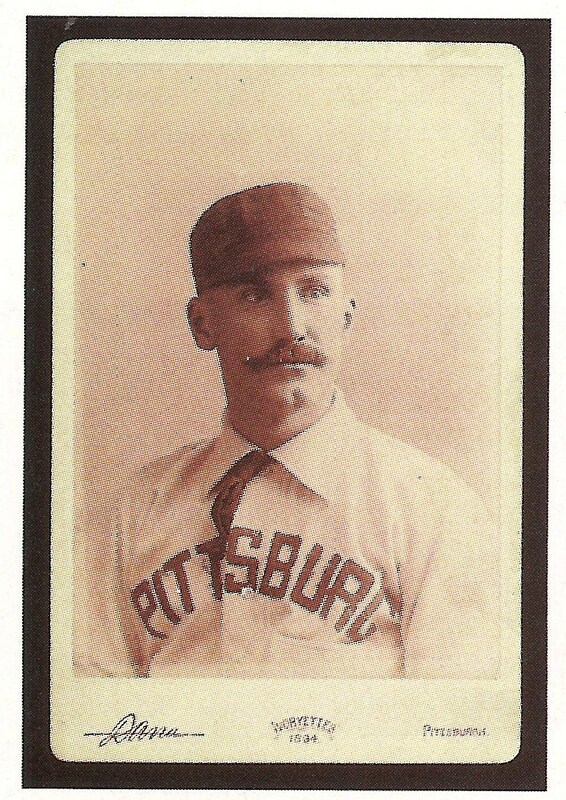 It is also unclear whether the stolen Mickey Welch cabinet card has been returned to the Hall of Fame. It appears that Hall of Fame leadership may have issued a gag order to employees in relation to the thefts. The Baseball Hall of Fame’s A. Bartlett Giamatti Research Center houses a collection of 3 million documents and over 500,000 photographs. Since 1988, rumors of substantial thefts from the Hall’s collection have circulated throughout the collecting community, but sources with knowledge of the thefts and related investigations have declined to speak publicly about what they know. The Hall of Fame’s continued resistance to comment or issue any statement about the thefts is troubling to many donors and patrons of the museum who are also reluctant to make public statements about the thefts. News of the Hall of Fame thefts has received little attention outside of the reporting by Haulsofshame.com. Many SABR members and others in the baseball research community are simply unaware that such a situation even exists. When contacted for comment, SABR member and former Baseball Commissioner Fay Vincent reinforced the lack of public awareness for the problem stating, “I am reluctant to speak because this is the first I have heard of these thefts.” SABR vice president Bill Nowlin also declined to comment when he was contacted for his reaction to the news that the SABR contact sheets played a part in documenting the Hall of Fame thefts. This contact sheet from a 1983 SABR photo shoot proves that the Jake Beckley cabinet card is the property of the National Baseball Library. The revelation of the theft of the rare Beckley card is the latest in a series of grim discoveries related to the Hall of Fame’s astounding collection of baseball artifacts. Over the past three months major sports auction houses have offered numerous items that have been suspected as being wrongfully removed from the Hall’s collections. Lot 1212: 1908 Chicago Cub Protested Game Affidavits. -Affidavits signed by Chas. Fraser, Jimmy Slagle and James Gilruth. The Hall of Fame’s August Herrmann papers archive features over 45,000 documents including all of the incoming correspondence to Cincinnati Red owner August Herrmann spanning from 1902 to 1927. It includes letters regarding Reds business as well as correspondence related to Herrmann’s chairmanship of Baseball’s ruling body, the National Commission, in the years before there was a baseball commissioner. The files also include the correspondence, statements and supporting affidavits regarding protested games in the National League during these same time periods. Sources indicate that the recently withdrawn auction lots were returned to their consignors with instructions to contact a special agent of the Federal Bureau of Investigation. One of those consignors, prominent collector John Rogers of North Little Rock, AK, stated that he has called the FBI, but to date has not been contacted regarding his suspected stolen lot. Rogers purchased his lot of 19th century Boston Base Ball Club Stock certificates in a 2006 MastroNet auction. The stock certificates are suspected to have originated from the Hall of Fame’s Frederick E. Long Papers Collection, which includes business records of the Boston Baseball Club spanning from the 1870s to 1890s. Both stolen photos of Mickey Welch and Jake Beckley were sold in a 1999 auction by MastroWest. The same Welch card appeared for sale at Robert Edward Auctions before it was withdrawn. What about the H&B contract archives-info? The lelnds #257 Sisler bat from H&B display – did H&B sell this? Is the Roger Connor cabinet card pictured with the Beckley card still in the Hall of Fame collection or is it missing too? When asked in May, Hall of Fame library employees were unable to locate the Connor Joseph Hall cabinet and others. We are not sure if they have located it, as they have not responded to several inquiries since.